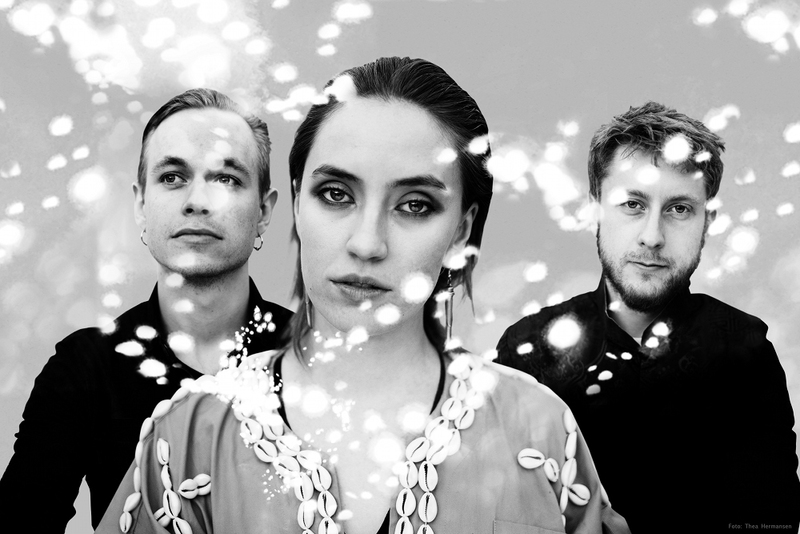 Norwegian band Highasakite have started taking over the world with their richly textured, brilliantly strange take on pop music. Having released their debut album Silent Treatment earlier this year to international, they’re heading down under for two very special, highly anticipated gigs – and if you’ve ever seen a clip of them live, you’ll know what I mean. (If you haven’t, you’ll find one below.) They’re not planning to scale down their production for their Aussie tour, either. Despite the relatively small club venues, planning to deliver a pristinely produced set that will look as stunning as it sounds. You may have heard single Since Last Wednesday on Triple J, but I can’t recommend their full album enough. It’s interesting, it’s quirky and it’s unlike anything you’ve ever heard before. Shimmering at times, rumbling at others – Highasakite are something really special. We had a chat to lead singer and core songwriter Ingrid about how the band went from meeting at a Jazz school to becoming Highasakite, Scandinavian musical stereotypes and their upcoming tour down under. So this will be your first time in Australia! What are you looking forward to most? I think I’m looking forward to the country itself, and the whole world there, the kangaroos and everything. I’m nervous about the spiders, but also excited about the beaches! The weather here in Norway right now is really cold, so I’m excited for the weather over there. Does a lot of planning and work go into your live shows? You have some pretty beautiful set ups – lots of lights and effects! We have a light designer with us – she does all that, so we don’t have to think about that! It makes it easier for us. Do you think Western audiences have a different reaction to your music, as opposed to Scandinavian audiences? Maybe, I don’t really know. It’s been really well received here in Norway, and Scandinavia, but also we’ve had a really good response from Australia and the US too. People have been positive all over the world. There are often comparisons between Scandinavian musicians such as Bjork and Lykke Li, in Western eyes. What are your thoughts on that comparison? I don’t think it’s very accurate, and I don’t think it’s very original. Bjork is like this cult figure and she’s the start of indie or alternative pop music. I think it’s easy to compare people with Bjork in English because she’s the cult figure in that music. I think, with Lykke Li, she is the biggest indie pop music artist right now, so I think it’s really typical. I don’t like it because someone once said I was a copy of Lykke Li. It really offended me, I don’t want to be called that. Definitely not! Can you tell me a bit about your band name? It’s from the Elton John song Rocket Man. I was listening to that song a lot at that time, and we needed a name really fast. That’s awesome, I love that song! Some of you met at a Jazz Conservatory, didn’t you? Did you originally plan to go down a more traditional musical path? Yeah! That was something I really wanted to do until I started my second year. It just didn’t really fit me that well anymore, and I didn’t want to do it for some reason. In Norway, we have a really good jazz scene. It’s like modern jazz, but I just didn’t want to do it anymore. You did a lot of traveling around when you were writing Silent Treatment – does your location/scenery influence your work? It gave me a lot of peace and quiet, and some time to go a little bit nuts. Not like, go crazy, but you know when you’re alone a lot you get a little bit… Weird…. I just wrote down everything I could come up with. It really meant a lot that I was alone in big cities. Is it only you that writes for the band, or is it a collaborative process? I write the chords and the lyrics alone, but the band brings it all together. We get with the producer and everyone collaborates. I don’t know what inspires me. Peace and quiet, and some kind of inner urge to create something. What inspired you specifically with Iran? What is the story behind that? I think it’s just a groovy song making fun of the Western and Eastern way of looking at things, and how web interpret how they are. It’s difficult to say in English! What have been some of the highlights of these past 12 months or so? I think a highlight is the whole year! We toured Europe, which was the most fun part of it. All the festivals were a really big experience. I think just the releasing of the record and how we’ve worked so hard and watching it be received so well is definitely the biggest highlight though. What is next for you after your time in Australia? We have a tour in Norway, and then after that I think we are just going to do more touring. So when will you make it back to your peace and quiet, and get back into writing? Are you having a break any time soon? Yeah, I think in November, I can go into my own little room and make some music for a while. I’m not really trying to do that at the moment though.